Kawanabe Kyosai (1831 - 1889) Fiery God Fudo and Assistants, 1874. Oban. This is a very good and famous print from the less well known but hugely collectible artist Kawanabe Kyosai. A pupil of Utagawa Kuniyoshi and son of a samurai, Kyosai was a political satirist and famously described as “perhaps the last virtuoso in traditional Japanese painting”. Some consider him the natural successor to Hokusai and as the first political caricaturist of Japan. Although this print is the most commonly reproduced of Kyosai’s work in catalogues it rarely comes to the market. It represents one of the five 'Kings of Wisdom' in Buddhism. The print though is a satire on Japanese society because the terrible God Fudo is reading a popular newspaper whilst his assistants prepare food for him. Seitaka is warming a sake bottle and Kongara is cutting meat for his supper; a leg of beef is seen hanging on the right of the print. Kyosai was a pupil of Kuniyoshi and we can see again in this print the influence of western art and design in the drawing of the figures - Fudo here resembles Hercules, and the overall quality and composition has something of the English eighteenth century satires of Gilray about it. 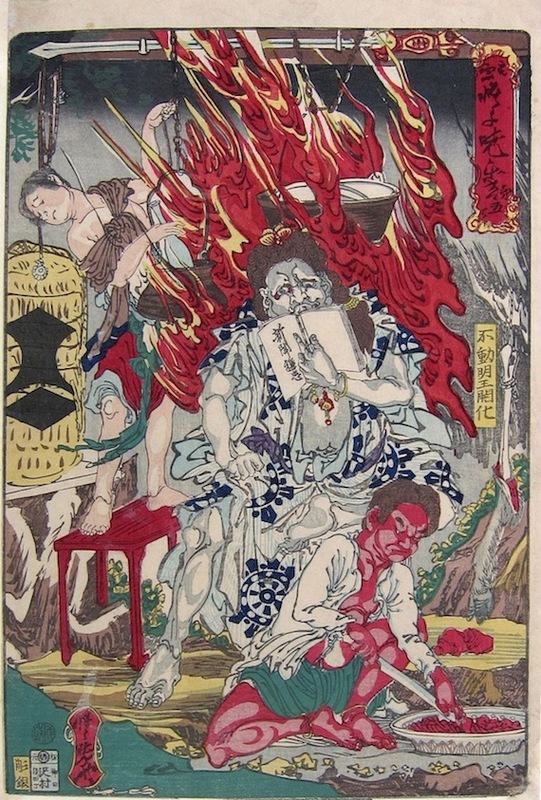 It is a humorous piece, the flames of the cooking fire evoke the more serious flames of hell with which Fudo is associated and the thrust of the design is presumably critical of the modern, relaxed society that Japan had become in the 1870’s. The print is in very good condition, very good colour with additional mica to the upper background and a fine impression. The print is reproduced on page 114 of Shoseki, Kyosai Giga, 1982.